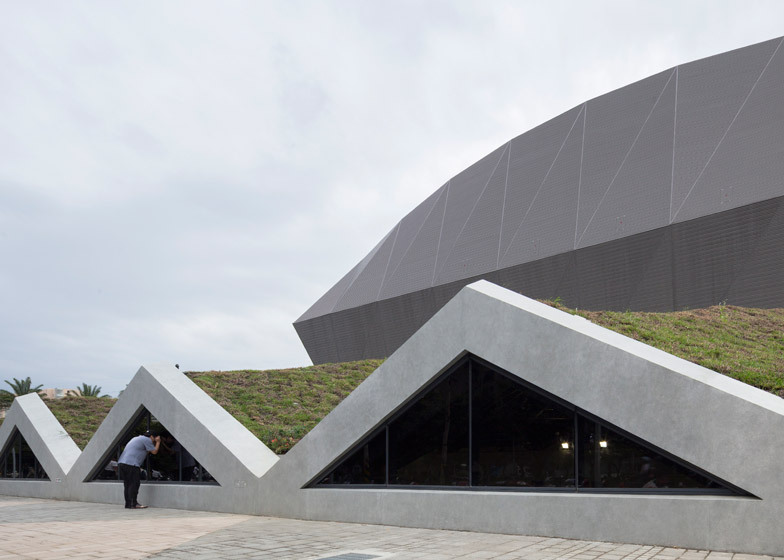 Taipei studio Q-Lab has completed a sports centre in Taiwan that appears to be shrouded under a huge faceted hood (+ slideshow). 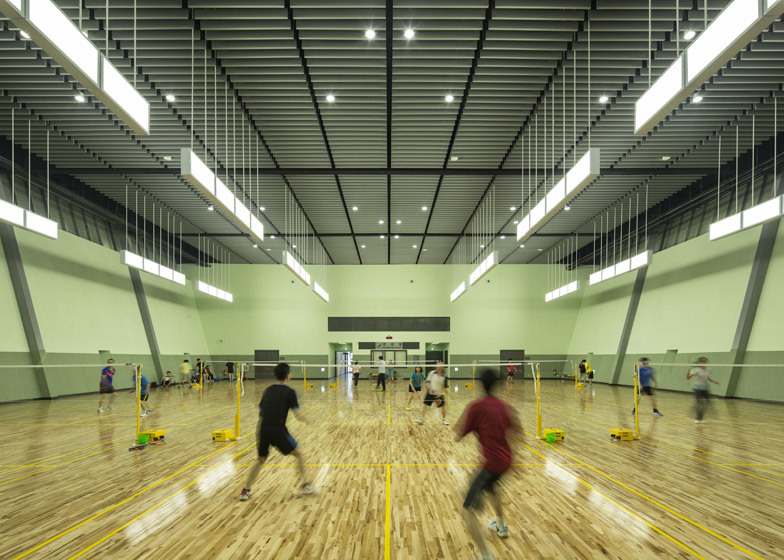 Located in New Taipei City, the municipality that surrounds Taiwan's capital, the Zhonghe Sports Center provides public facilities for a range of sports and activities including badminton, basketball, rock climbing and hockey. 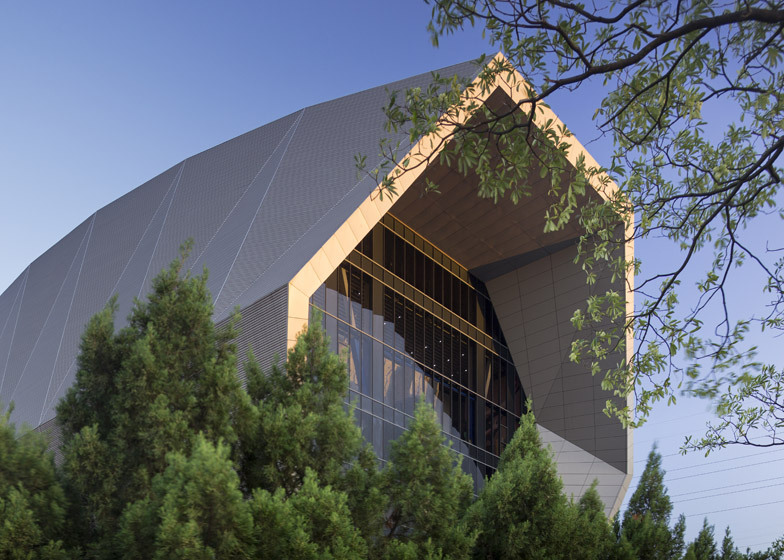 Q-Lab stacked the various sports halls and fitness suites into a bulky but compact structure that rises up above the surrounding trees. 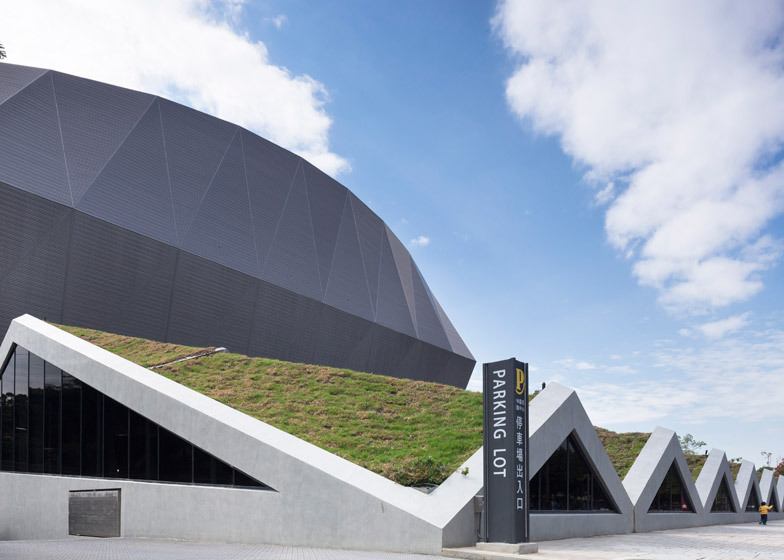 It features a hexagonal profile, a grey aluminium skin and a multi-storey wall of glazing. 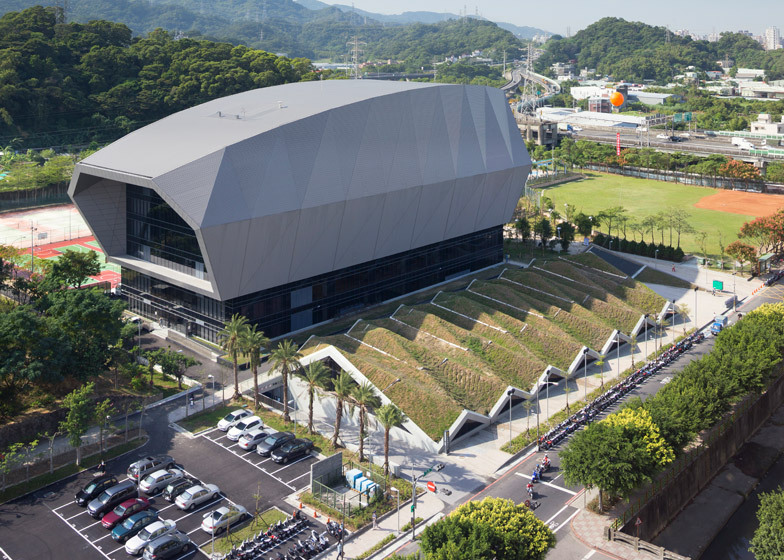 According to the architects, this 38-metre-high form was a response to a strict budget, but also a desire to avoid creating a building that looks like an office block – something they felt was too common of inner-city sports centres in Taiwan. 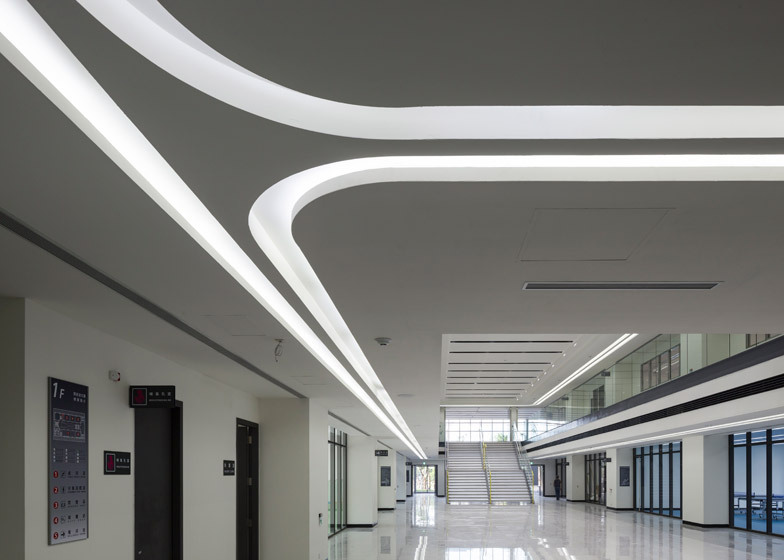 "These buildings often do not reach their full potential, nor open up opportunities to the general public in terms of social engagement and spatial arrangement," said the team. 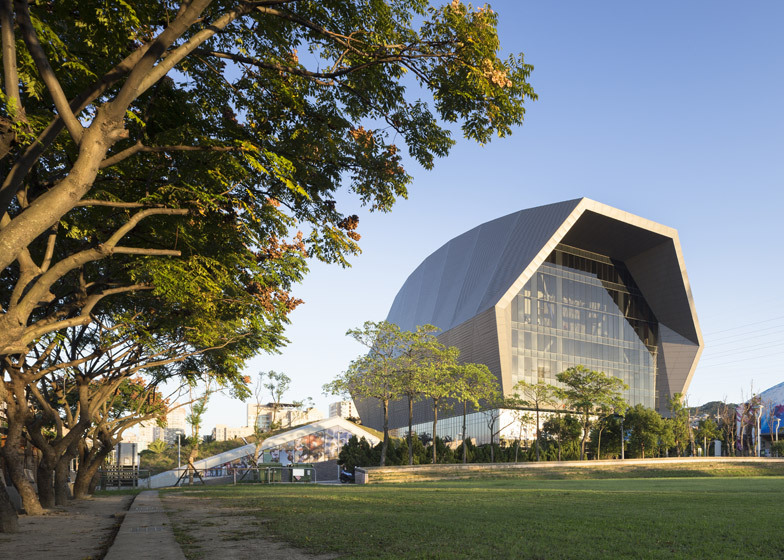 "Lack of spatial and visual qualities are often the aftermath or syndromes of this building type, particularly in the metropolitan cities of Taiwan." 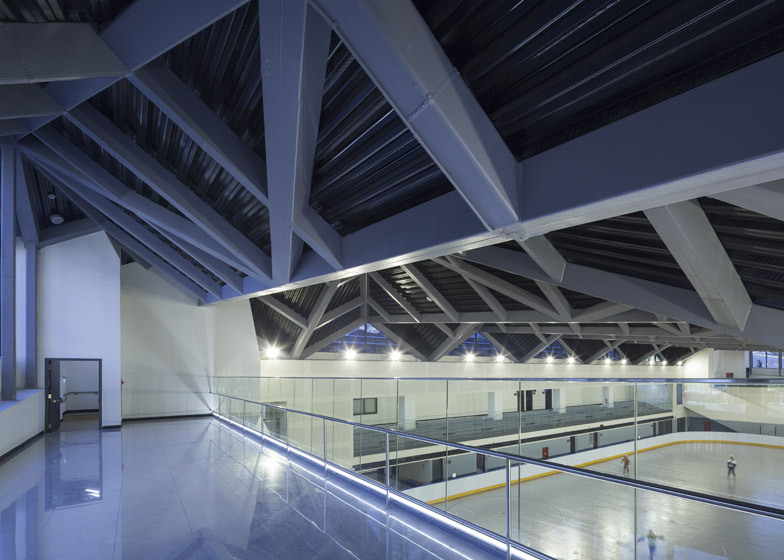 The complex is situated on the edge of a park, hemmed in by a road to the north, a car park to the east, and a swimming pool and basketball court to the west and south. 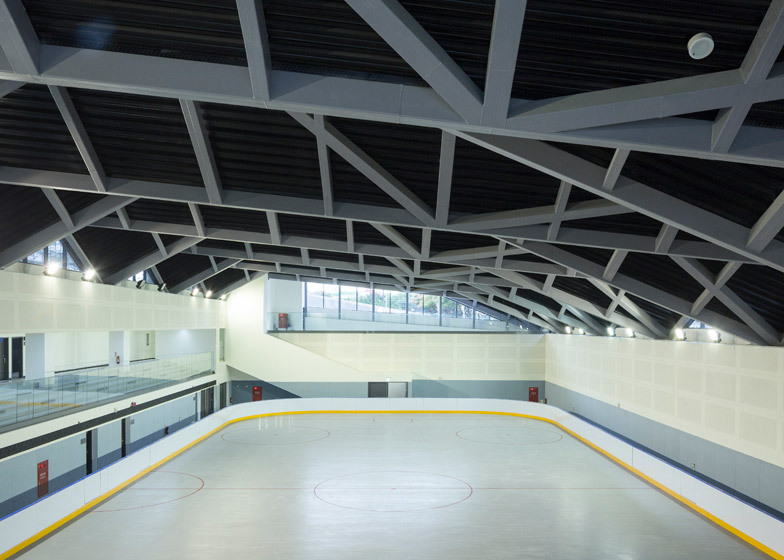 The building takes up half of this site, while the other half was used to create a sunken hockey pitch. 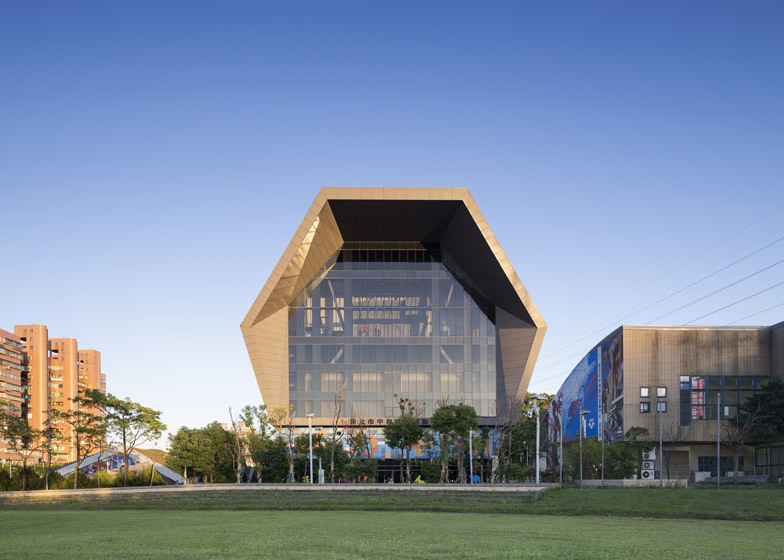 A grassy roof extends over the top of this facility to help it integrate with the surrounding parkland, but a series of triangular clerestory windows create a zigzag around its perimeter, allowing passersby to peep inside. 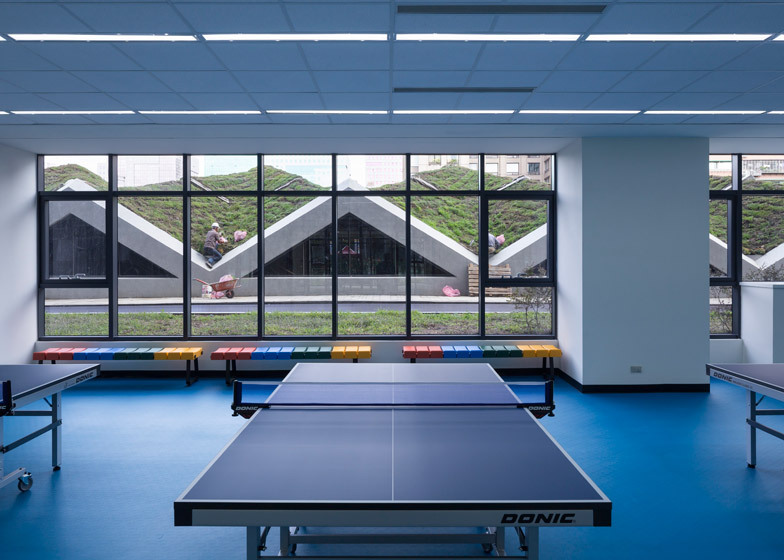 "One big decision was to house the field hockey rink away from the main building and bury it deep into the basement, revealing only its triangulated roof with grass covered on top," said the design team. 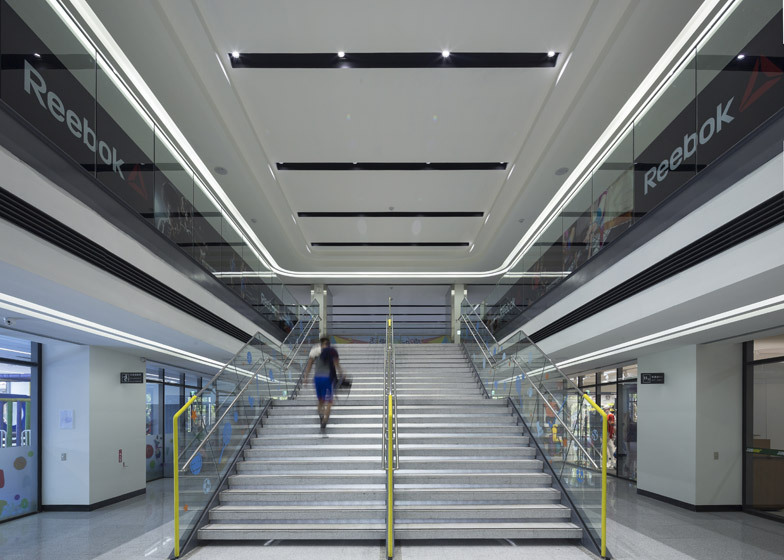 "By doing so, we were able to reduce the building height and create less urban congestion in terms of building mass and scale," the team added. 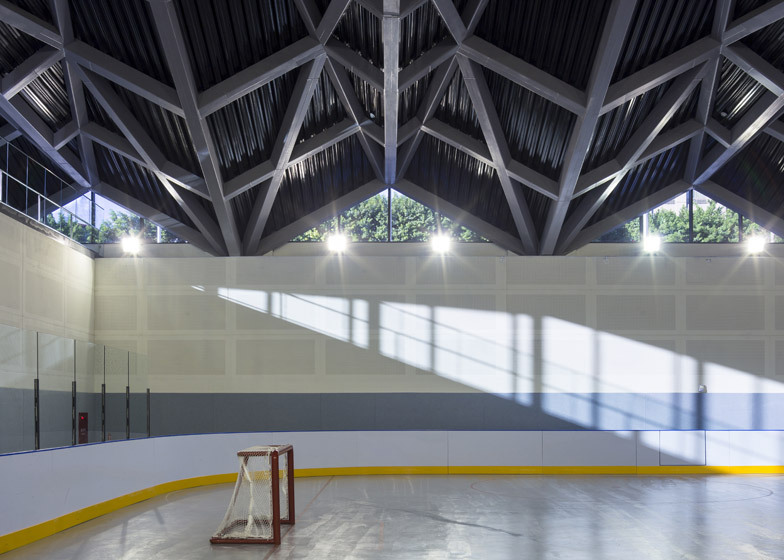 "Moreover, with grass and soil covering the roof of the hockey rink, we were able to prevent summer heat penetrating directly into the interior space." 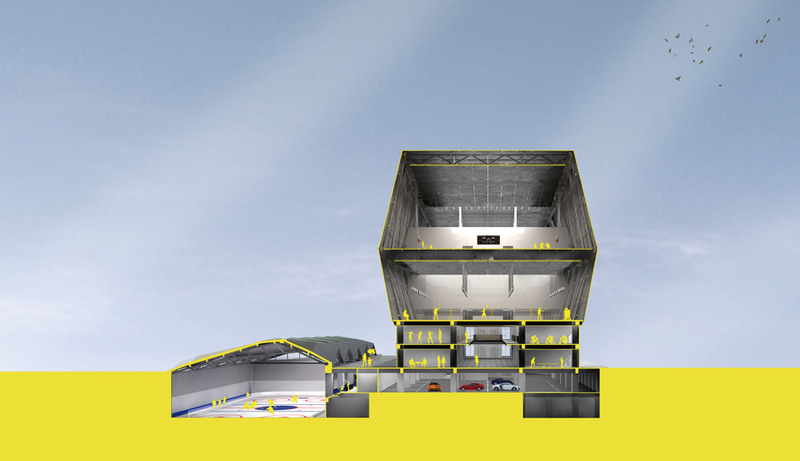 The roof spans almost 60 metres without any supporting columns, allowing an uninterrupted game-playing space below. 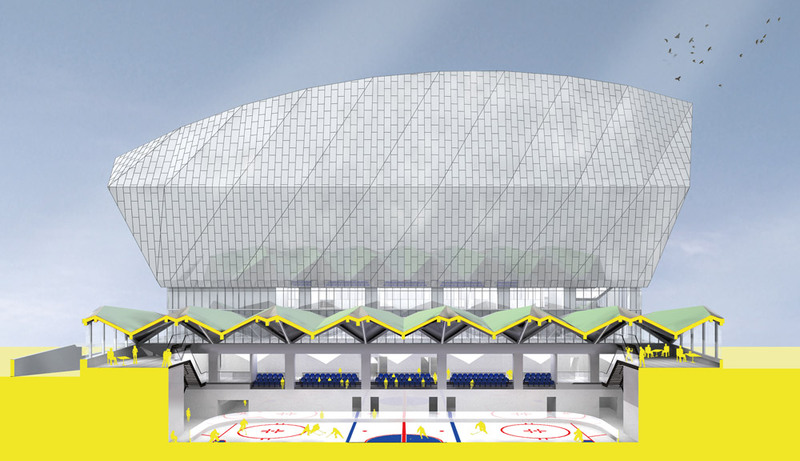 There are also over 200 seats for spectators. 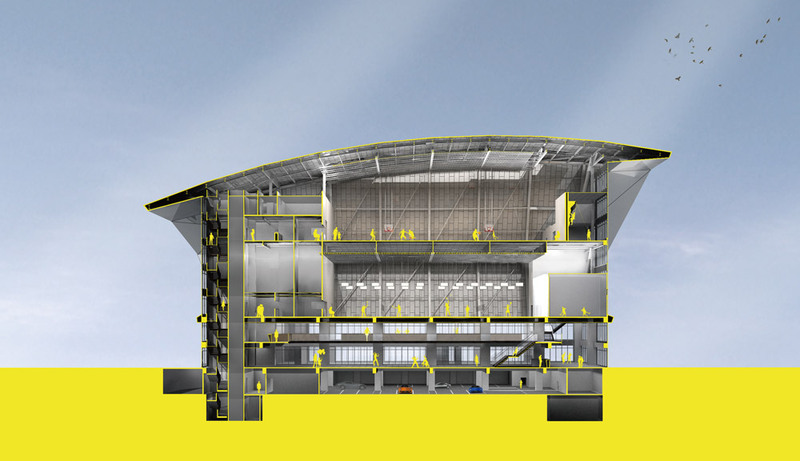 The main building is organised around a double-height first-floor atrium. 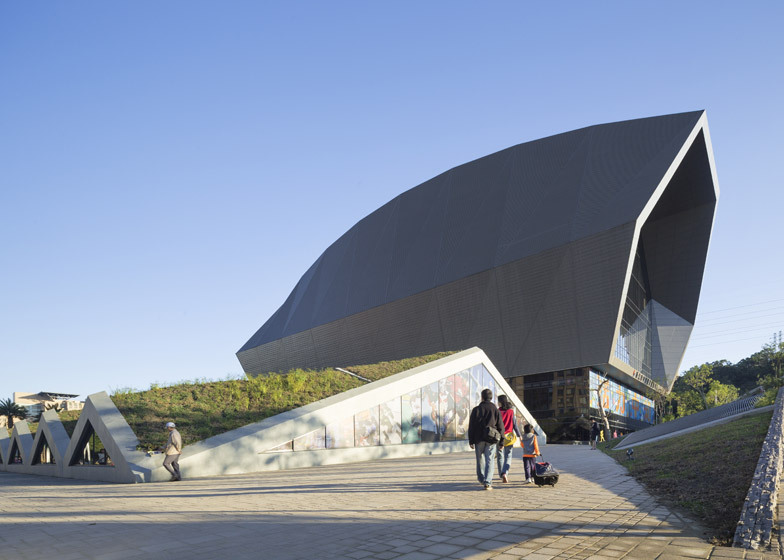 Conceived as an "urban living room", the space is filled with chairs and tables to encourage visitors to linger before and after sporting events. 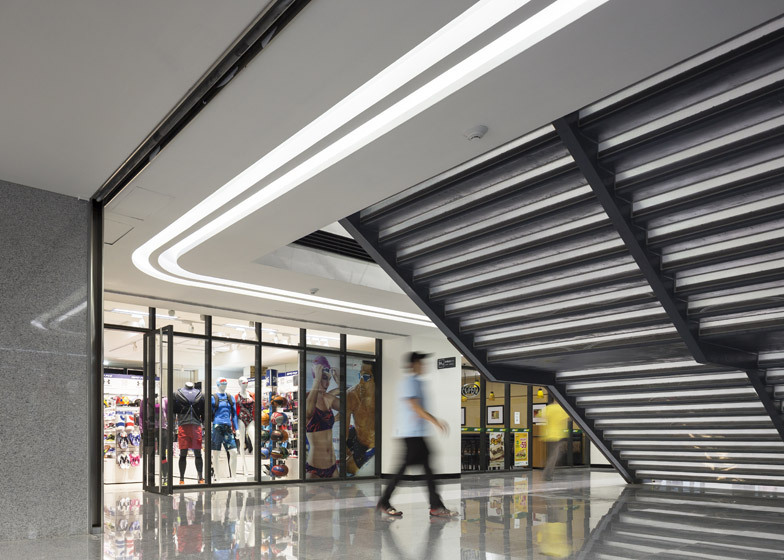 Mezzanine corridors on either side of the atrium lead though to a fitness room, a spinning-bike room and three yoga rooms. 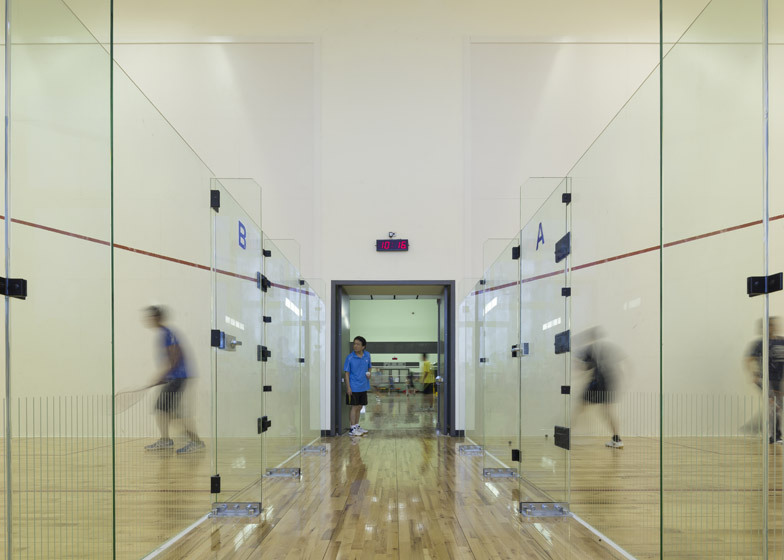 Six badminton courts and two squash courts are located on the level above, while the uppermost floor houses indoor basketball courts and facilities for rock climbing. 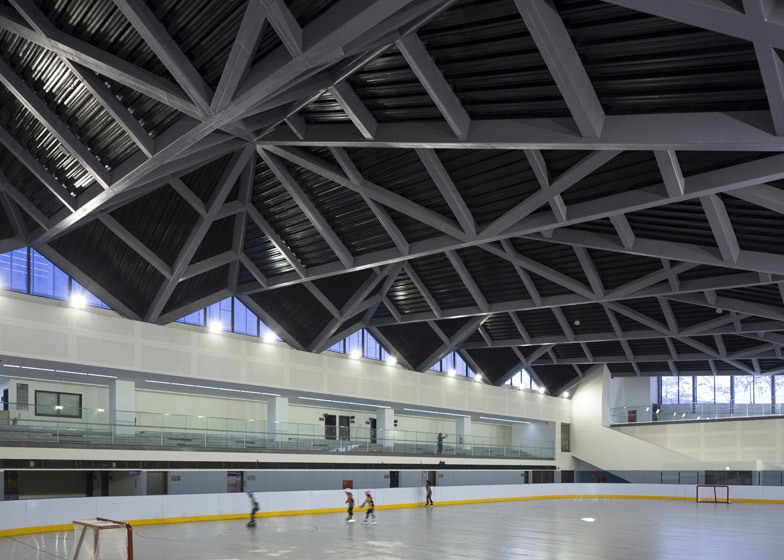 To keep the project within budget, Q-Lab only used steel frameworks to span the large sports halls. 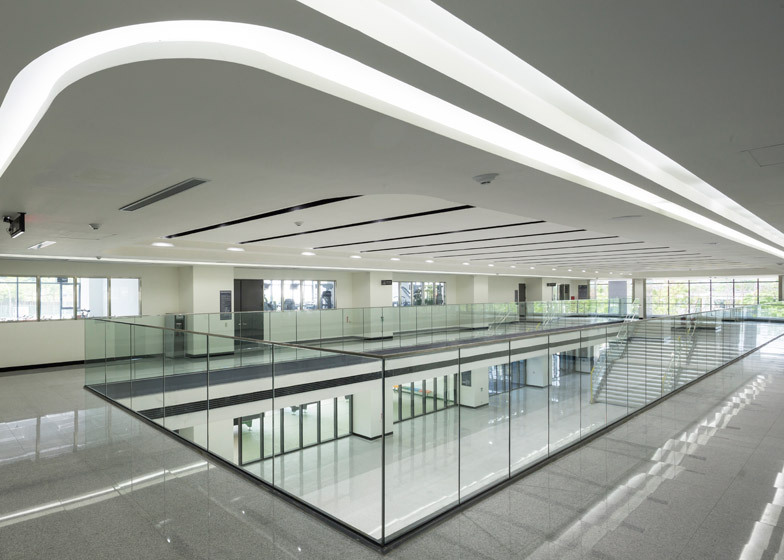 The rest of the structure was built using reinforced concrete. 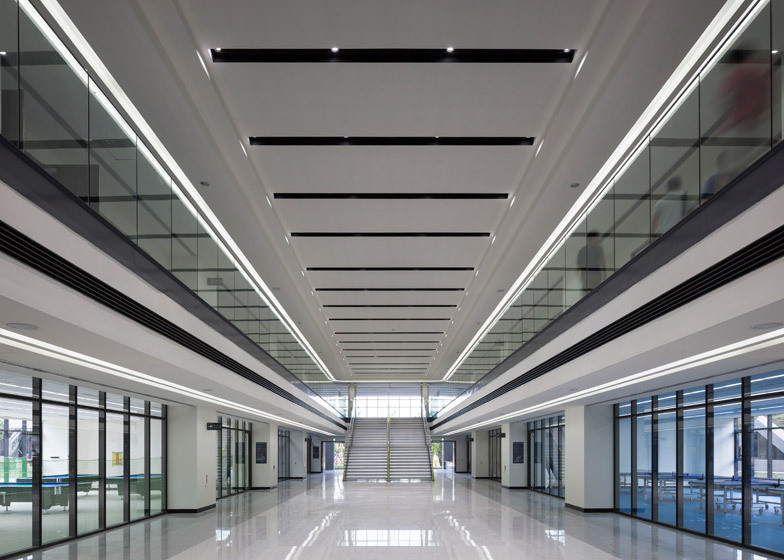 "We spent a tremendous amount of time finding the optimal building geometry so that all the column spacing would be equal and aligned, all the facades would be modulated and unitised, and all the structure pieces would be easily erected and assembled," added Q-Lab. Photography is by Highlite Images.